The healthcare industry is in a state of accelerated transition. The proliferation of data and its assimilation, access, use, and security are ever-increasing challenges. Finding ways to operationalize business and clinical data management in the face of government and market mandates is enough to keep most chief officers up at night! Leveraging Data in Healthcare: Best Practices for Controlling, Analyzing, and Using Data argues that the key to survival for any healthcare organization in today’s data-saturated market is to fundamentally redefine the roles of chief information executives—CIOs, CFOs, CMIOs, CTOs, CNIOs, CTOs and CDOs—from suppliers of data to drivers of data intelligence. 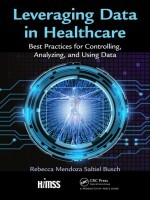 This book presents best practices for controlling, analyzing, and using data. The elements of preparing an actionable data strategy are exemplified on subjects such as revenue integrity, revenue management, and patient engagement. Further, the book illustrates how to operationalize the electronic integration of health and financial data within patient financial services, information management services, and patient engagement activities. An integrated environment will activate a data-driven intelligent decision support infrastructure. The increasing impact of consumer engagement will continue to affect the organization’s bottom line. Success in this new world will need collaboration among the chiefs, users, and data creators.